This is a beautiful piece of art work from artist SAL BUSCEMA and inker JOE SINNOTT! This page from (1978) WHAT IF? #12 (page 18) was done on large size comic art page, with great CAPTAIN AMERICA and RICK JONES action! Artwork comes protected in a plastic top loader! Own this great piece now... 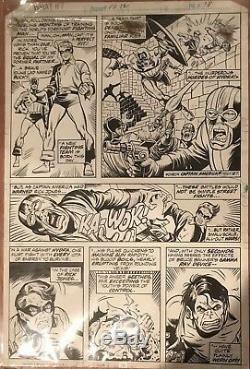 The item "(1978) WHAT IF #12 pg 8 Sal Buscema & Joe Sinnott Original Comic Art Page" is in sale since Saturday, December 15, 2018. This item is in the category "Collectibles\Comics\Original Comic Art\Interior Pages". The seller is "the_comiclord" and is located in Wixom, Michigan. This item can be shipped to United States, Canada, United Kingdom, Denmark, Romania, Slovakia, Bulgaria, Czech republic, Finland, Hungary, Latvia, Lithuania, Malta, Estonia, Australia, Greece, Portugal, Cyprus, Slovenia, Japan, China, Sweden, South Korea, Indonesia, Taiwan, South africa, Thailand, Belgium, France, Hong Kong, Ireland, Netherlands, Poland, Spain, Italy, Germany, Austria, Bahamas, Israel, Mexico, New Zealand, Singapore, Switzerland, Norway, Saudi arabia, United arab emirates, Qatar, Kuwait, Bahrain, Croatia, Malaysia, Brazil, Colombia, Panama, Jamaica, Viet nam.